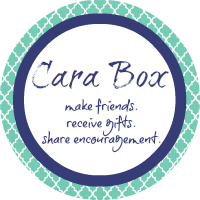 This was my first month to participate in the Carabox exchange organized by Kaitlyn @ Wifessionals. It was really fun to meet two new bloggers and go shopping for fun things. I love anything with a theme! Toga party, anyone? lol. I got Nutty Bars and Nips, yum! Nailpolish and nailclippers which were totally cute, and I loved the bright nail colors! A cute notepad, and 'new' scent of bodyspray which smells like springtime and is the perfect size for carrying around with me. My favorite were the Nike stretchy headbands! Super cute and they have little grippy things so they will stay in your hair. Totally awesome!! My other Carabox partner was Natalie @ Priceless Overdose﻿. Her blog is really fun too, you can check by there to see the N themed things I sent her! All in all, I really enjoyed participating in the exchange/meeting new awesome blog friends and plan to do it again in the future! How fun! She created such a nice package for you!! Fun! I love the "N" theme. The Nutty Bars crack me up! I love Nutty Bars. They remind me of my great grandmother and how we'd eat them when we visited!